You Deserve Only The Best ! Oil, grease, mildew, and other unwanted stains can build up on your deck over time. Similarly, winter weather can take a toll on your deck. At Pressure Pros we have the equipment and expertise to provide you with a completely customized deck cleaning solution. And because we value your business, we go out of our way to do a meticulous job. Your Brick Pavers is one of the first things people will notice when they approach your property.Whether its your driveway or pool patio.So if you want to keep your exterior looking its best, turn to Pressure Pros Of Palm Beach, Inc. We offer thorough and affordable Paver cleaning & Sealingfor residential and commercial customers in Palm Beach County, FL. Do your gutters need a good cleaning? You could spend your weekend doing the work yourself, or you could come to Pressure Pros Of Palm Beach, Inc, an established gutter cleaning service in Palm Beach County, FL. Whether you’re in need of a one-time cleaning or are looking for a yearly maintenance package, we’re the team to trust. You deserve to work with a Palm Beach County, FL, cleaning service you can trust. Pressure Pros Of Palm Beach, Inc holds itself to a high standard to better serve Palm Beach County, FL, residents. We will not rest until the outside of your home or business is spotless. To schedule an appointment for your Power Washing and cleaning services, call us today! An affordable pressure cleaning service can provide an unmatched value to area homeowners and entrepreneurs. Pressure Pros Of Palm Beach, Inc takes pride in providing outstanding service while still keeping prices reasonable. With our help, Palm Beach County, FL, can have clean buildings making a great impression . 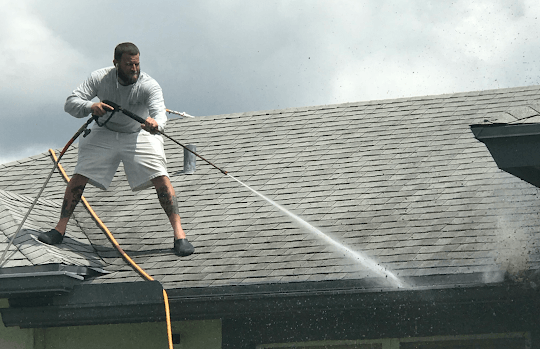 An affordable Soft Wash Roof Cleaning service in the Palm Beach area can provide unmatched value to area homeowners and entrepreneurs. Pressure Pros Of Palm Beach, Inc takes pride in providing outstanding service while still keeping prices reasonable. With our help, Palm Beach County, FL, residents can have clean, beautiful buildings that make a great impression on everyone who passes by. An affordable pressure cleaning service can provide an unmatched value to area homeowners and entrepreneurs. Pressure Pros Of Palm Beach, Inc takes pride in providing outstanding service while still keeping prices reasonable. With our help, Palm Beach County, FL, residents can have clean, beautiful buildings that make a great impression on everyone who passes by. A Palm Beach area cleaning service can make the exterior of your home look great. At Pressure Pros Of Palm Beach, Inc, we provide thorough, methodical commercial and residential cleaning services to the Palm Beach County, FL, community. Our skilled cleaners employ care and attention to detail during each job they undertake. If the outside of your home or business is beginning to look dingy or dirty, it might be time to set up an appointment with our company. The aesthetic appeal of your Palm Beach home or commercial building’s exterior is an important part of making a good first impression. If your home looks grimy and filthy, it will reflect poorly on you and your family. If your commercial building looks dirty or dull, it can turn off potential clients or customers. Fortunately, our company can help. We provide Residential Power Washing and Commercial Power Washing services to area residents and business owners. Our dedicated cleaning crews will visit your building and wash every surface until it is bright and clean again. We also wash roofs and decks. We offer many different cleaning packages that will fit the needs and budget of each of our customers. ABOUT PRESSURE PROS OF PALM BEACH, INC. I have been in the pressure cleaning industry for quite some time with 30 years of experience. I have both a residential and commercial clientele list. We are licensed and insured. We work with the Home Owners Association to maintain the exterior appearance of homes. A neglected roof or driveway will reduce the value of the homes curb appeal. Granules on roof shingles will deteriorate if not properly cleaned and cared for. We can help make sure that the appearance of the home is in the best condition possible. Simply having your roof cleaned by a certified professional will cost a lot less than replacing the whole thing. If you need maintenance around your pool area, fences, decks, walkways, gutters, cleaning of outside statues, brick pavement, molded and mildewed wood panels, or discoloration of the siding of your house, call us today. We provide fast and professional service. The service was excellent!! they did a great job cleaning my driveway – they were on time & professional & the price is very reasonable.